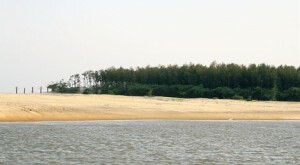 At a distance of 88 km from Balasore, 4km from Chandaneswer and 8 km from Digha (West Bengal) is the tranquil beach at Talasari. One could behold with surprise the glistening glory of the Bay of Bengal spread like a bejeweled carpet as far as one’s eyes could reach. The shimmering surface, the myriad twinkles all around give this calm beach a unique status of its own. This entry was posted in Orissa, Seabeach, Talasari. Bookmark the permalink.